Many years ago my doorbell buzzed. SURPRISE!!! It was a delivery from the California Endive Farms that totally charmed me—a bouquet of purple endives (a perk of being a member of the International Association of Culinary Professionals). Everyone loves getting a surprise bouquet, but this one was edible, which in my book is even better. Flowers are gorgeous, but they die! A bouquet of endives has longevity, so much so that the memory of this delivery inspired the dish I made for the New York Women’s Culinary Alliance spring potluck—endive stuffed with an asparagus, radish and cucumber salad and topped with bacon lardons, egg, “crouton-ettes” and a mustard-tarragon vinaigrette. I decided to make a version of the classic French bistro dish, a frisée salad with bacon lardons, but in something that was easy to eat, an endive. A Belgian endive is not French, although endive is very popular in France. But Belgian endive and frisée are both from the chicory family. Not sure why it’s called Belgian endive, but perhaps the Belgians discovered or came up with the CRAZY way it’s grown. Belgian endive is grown from a chicory plant that grows for five months outdoors. It’s leaves are mowed down and the root is dug up and put in a dark, moist, cellar-like environment so the bud grows again into a single endive in about four weeks. I called my colleague, Richard Collins, at California Endive Farms, and he was kind enough to send me a bouquet of endive, some endives for my dish and more endive for the members of the New York Women’s Culinary Alliance to sample. You can see pictures and get some more delicious recipes at www.endive.com. My rediscovery of tarragon which I used in the mustard vinaigrette. Très français, très delicieux! How gorgeous it looked when I served it— the gals at New York Women’s Culinary Alliance loved it! Showing off the bouquet and raffling it off at the potluck—congrats, Susan! 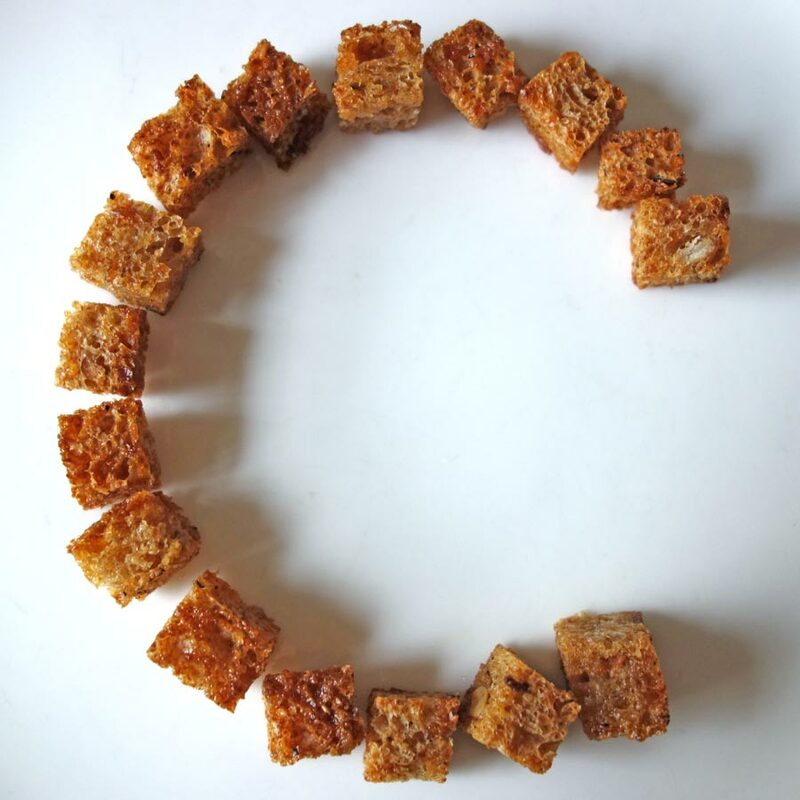 Making the adorable croutons—I totally “manifested” the bread—right out of The Secret! How easily it becomes a vegetarian (remove bacon) or vegan dish (remove bacon and egg). OK, I have a lot of favorite faves. Your guests will love this dish! 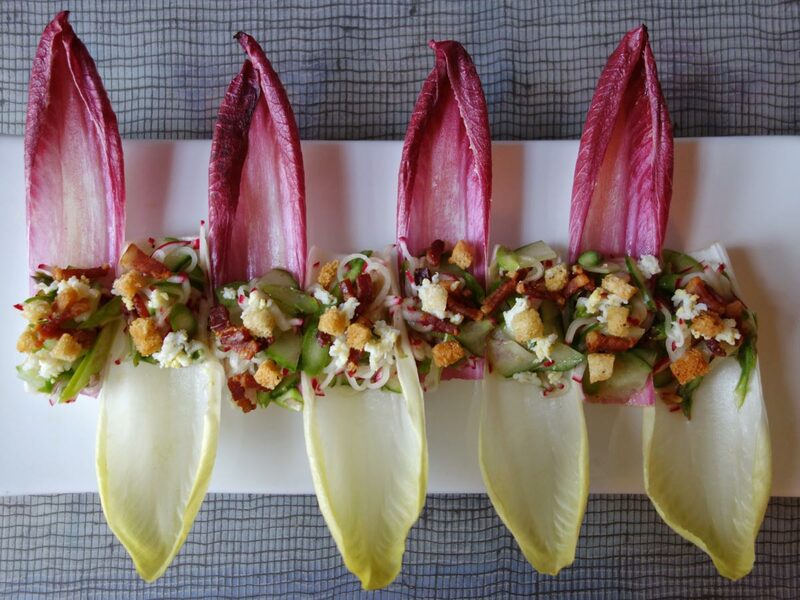 This dish looks great on a plate, especially if you can get the red and white endive for contrast. Bring water to boil in a medium saucepan. Have ready a medium bowl of iced water and a colander. Slice asparagus stalks into thin rounds, saving the tips for another use. Blanch the asparagus rounds by plunging them into the boiling water, bringing the water back to a boil and then draining it in the colander and plunging it into the iced water to cool. Drain again. Place asparagus on her towels or a clean kitchen towel to remove excess water. Peel, seed and halve the cucumber and slice it very thinly with a knife or a mandoline. Slice radishes very thinly with a knife or a mandoline. Separate egg yolks from the egg whites and press them both through a semi-fine strainer and mix them together. In a medium bowl, mix asparagus, cucumber and radishes with salt, pepper and a drizzle of extra-virgin olive oil. Place endive on a plate or sheet pan and carefully fill with asparagus salad. Top the salad with a sprinkle of egg, then bacon. Drizzle with Mustard Tarragon Vinaigrette and top with “Croutonettes”. Yield: Serves 8-10 as an appetizer. Serves more as part of a potluck spread. Vegetarian version: leave off the bacon. Vegan version: leave off the bacon and egg.